The sound of church bell ringing woke me this morning. Bell ringing in downtown Calgary?…on a Wednesday afternoon? On the hour there was a minute or so of ringing, fine, but at midday, they launched into what can only be described as a hideous medley of modern tunes which would probably have been fine if played on a piano in the hotel lobby but not church bells. This went on for a very painful hour…Thank goodness I wasn’t in need of a late sleep as I know from past experience, not even earplugs can shut out church bells. I’m sure in amongst the a-musical cacophony I heard the theme from the Shining but mostly it sounded like two or three songs being played at the same time. Rubbish. Having said all that, this particular Fairmont hotel is a beautiful example of old Canadian Railway hotel modernization. The rooms are sumptuous and airy and the decor and fittings are well thought out. I ventured downstairs for breakfast once more hoping to get my fix of middle management mirth and in particular Crockford’s chirpy morning self. As usual, his shirt choice didn’t disappoint, a retina-burning fluorescent orange number upon which I commented “well you’re not going to get lost at sea in that are you?”. A very nice orange juice, Bircher Muesli and Cappuccino were swiftly delivered and breakfast was done. Back in the room, a glimpse outside and a sneak peek at my new Weather Underground iPhone app. confirmed that it was cold and about to snow. I stayed in and awaited check out time, which today was much earlier than usual as the hotel wanted the rooms back. 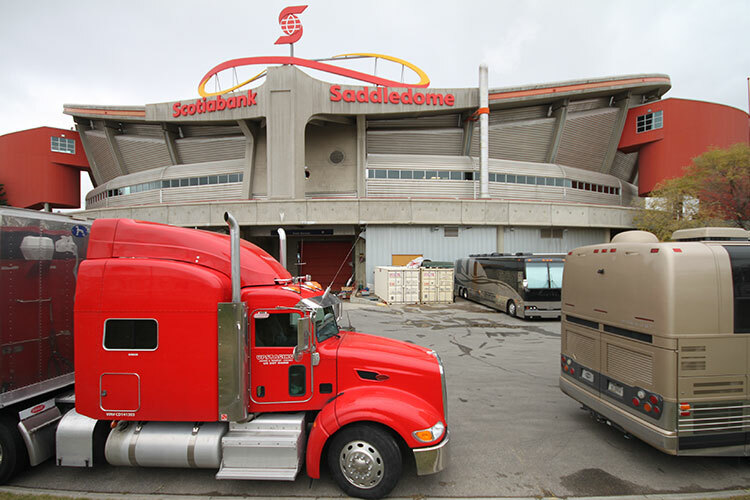 More often than not, Tim (tour manager) can arrange late checkouts since we use quite a few rooms but today we headed to the Saddledome early. You don’t often see cattle at a downtown arena venue but behind the Calgary Saddledome, there is a herd. I’m not entirely sure what that’s all about but all I could think was that they might be cold. Inside the warmth we settled into our dressing room and Ian made tea and I napped on a couch. A fatal mistake as napping before a show can leave you unfocussed and it took a good few songs during the show before brain and hands were in sync. A humbling reminder of how much concentration is required in this band. Never take anything for granted. Being at the venue so early meant that Glenn had the time to re-aquaint himself with the old girl. As diary readers of the past will know, Glenn practices a lot! 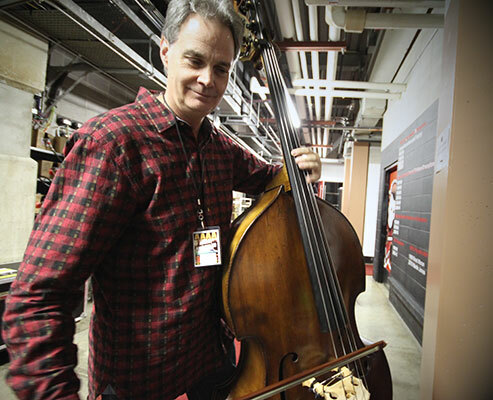 Sometimes for hours before a show, simply because the upright bass is a real handful. A humbling instrument if you’re not on top of your game. Needless to say, Glenn is. 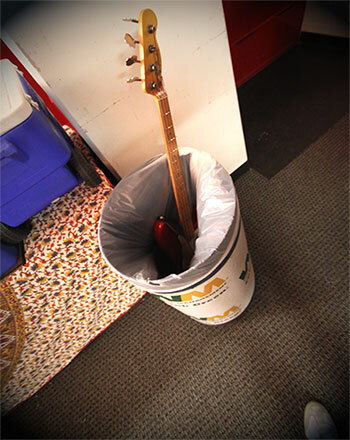 The electric bass he comes off stage with for some reason ended up in the bass bin…I guess he wasn’t happy with his command of it tonight…you could have fooled me! With another great show complete we headed off in the now settling snow to the airport where our aircraft for the rest of this tour was waiting. The Embraer Legacy. This has been our plane of choice now for some years but this evening, for the first time that I can recall, we had to de-ice the plane. 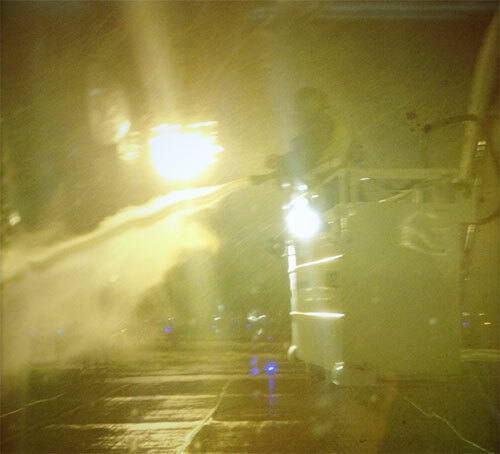 Well, we didn’t actually de-ice, this poor chap (snapped by John) on a cherry picker did. This involved a long taxi to a stand on the other side of the airfield where a de-icing truck sprayed us with ‘stuff’. 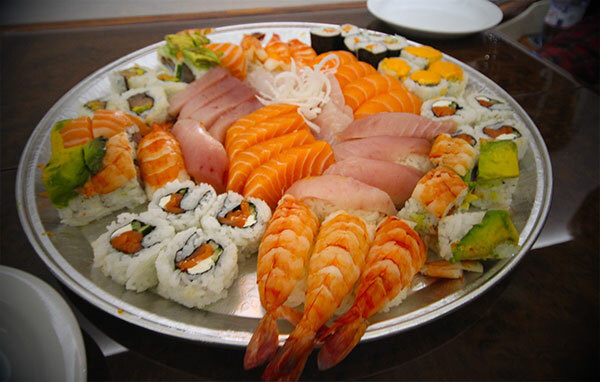 Our new stewardess, Amy wasted no time in expertly serving up plates of sushi. Sorry but how could I resist a photo. We are lucky men indeed. Soon we were in the air, heading for Vancouver, much milder temperatures AND a day off. Golf anyone?